We are very excited and pleased to announce that our beloved intersegmental mobilization massage table (or as referred to around the office, the Anatomotor) is back in action! For those of you who are not familiar with what an Anatomotor is, please have a read through this article to educate yourself. For those of you who have been waiting patiently, we would like to extend one FREE treatment on our new Intersegmental Mobilization Massage Table. Simply call us at 905-845-2291 to schedule your Chiropractic Adjustment and mention this blog to receive your free session. What is an Intersegmental Mobilization? An Intersegmental Mobilization (also known as the Anatomotor) is an automatic massage table mainly used for soft-tissue massage, spinal manipulation, lumbar & cervical traction, along with relaxation. This type of traction massage is used for cervical, lumbar, shoulder, hips, knees and ankles and has been used in North America since the 1940’s. In other words, it moves the facet joints of the spine and kneads the muscles. From a therapeutic perspective, it enhances blood flow to the paraspinal muscles. How does an Anatomotor Work? 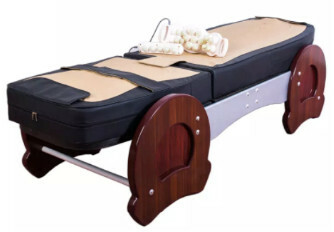 The massage table includes two separate, heated massage rollers. The first roller runs from the top of your neck, down to your lower back. The second roller runs down the length of the back of your legs. The rollers will slowly run up and down the back of the body, which will allow you to experience several cycles of not only stretching, but relaxation in a safe, non-invasive treatment on the body. This non-surgical, gentle therapy can help improve the body’s blood circulation, along with the exchange of nutrients, gas and waste between joints and soft tissue. This state-of-the-art therapy is often followed by a Chiropractic treatment with Dr. Brian Huggins. The therapeutic massage also leads to muscle relaxation, induces the breakdown of adhesions, increases circulation, spinal mobility and lymphatic flow. Give us a call to schedule your appointment: 905-845-2291 or fill out a form by clicking here.